Consequently, I started searching for radio-based flash triggers for the next meetup. Now, if I were buying the triggers for my Nikon DSLR this would not be much of problem. I would just buy Nikon-compatible triggers and be done. Unfortunately, most companies don’t make m4/3 specific accessories yet. Would a Nikon-compatible trigger work on my Olympus camera? Complicating the problem is the fact that I am mixing Olympus and Nikon flash units. I started with the Aputure Trigmaster Plus units. I thought they would fit the bill since they had separate versions for Olympus/Panasonic and were not too expensive. Although the outside box said Olympus/Panasonic, the individual triggers were labeled “for Canon” (more on this later). When I took them out of the box, I was initially very happy since they seemed to work perfectly. However, things went south quickly. After about a minute of inactivity the triggers seemed to go into some kind of sleep mode. After they went into that sleep mode, they would not “awaken” properly. The triggers only fired the flash about 1 in 10 times after coming back to life. The only way to get them to work properly again was to turn them off and on again — very cumbersome, and not practical for flashes on stands. After searching on the web again, I found another report of this behavior. I sent these back to Amazon. I briefly considered the Pocketwizard Plus III units. Although expensive, I was pretty sure they would fire reliably. However, they have a major drawback — no hotshoe compatibility. The form factor just doesn’t seem to be well thought out. You have to connect them with sync cords — cumbersome for most hotshoe flashes, but doable. The only problem is that the FL-600s don’t have a sync port. Now you’ve got to add an adapter on top of the trigger. This is getting ridiculous. Although Pocketwizard makes a hotshoe TTL system (FlexTTL) for Canon and Nikon, there is no such system for Olympus. While sturdy and reliable, the PocketWizard design and interface are just awkward. 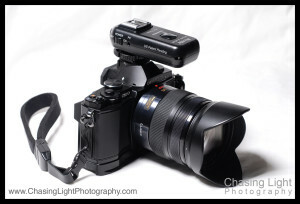 This criticism was also highlighted in a recent Lighting Rumors review of the new lower-cost PocketWizard Plus X triggers. On to the next choice, Phottix Strato II. They seemed like they would be perfect, but they didn’t make an Olympus version. Since I had Nikon flashes (and a D-200), I ordered the Nikon version. The cost was about $95 for a package with one receiver and one transmitter. Additional receivers are about $55. When they arrived, I was pleased to see that the hotshoe mounts on top of the units are metal. The passive mounts on the bottoms of the receivers are plastic, but solid. The Nikon units worked almost perfectly. They fired the flashes (Olympus and Nikon) reliably and they would even awaken the flash units from their sleep modes. The only issue was with the TTL pass through function for a flash mounted to the transmitter on the camera. This didn’t work. Since I noticed that the Apurture “Olympus” units were actually for Canon, I ordered a Canon transmitter. Eureka, everything works perfectly. The Nikon receivers fire my SB-800s in manual mode perfectly. The Canon transmitter mounts on the top of the camera and will fire flashes (both Nikon and Olympus) without fail; moreover, the Canon transmitter allows pass through TTL operation of a flash mounted on the transmitter mounted on the camera. Although the Nikon receivers will fire my Olympus flashes, I have purchased Canon receivers for them, since they have the same pin positions. Overall, this is a very happy marriage between all of the flash units. 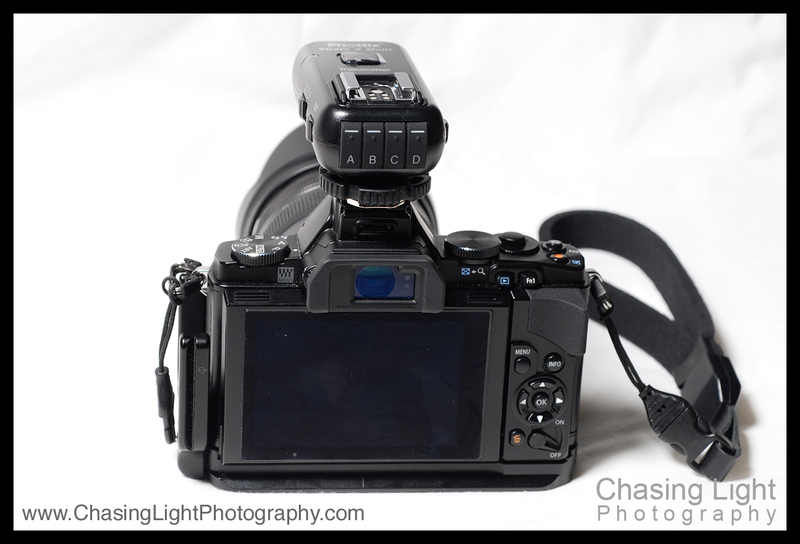 Oh yes, the Phottix Strato units also have the 4-zone operation just like the Pocketwizards. You can easily turn on and off zones from the transmitter — fantastic. Just push the buttons on the back of the transmitter on top of the camera. No menu diving–just push the button. Fantastic. You can see the buttons in the picture below. – The Canon transmitter passes through TTL information to an Olympus flash on the camera. – The Canon transmitter will fire a Nikon receiver. – The units wake flash units from sleep mode (both Nikon and Olympus). – The units are solidly built with metal hotshoe components. – The use of AAA batteries is helpful. – The four-zone operation is a great feature. – Range seems to be very good, although I haven’t really gone too far to test. – The triggers work fine with my AlienBees studio strobes. – They come with seemingly every possible cable you could need for any connection and a lanyard. The only possible drawback I could find compared to the PocketWizard system would be the 4-channel limitation of the Phottix units. The various Pocketwizard units have 16 or 32 channels. If you thought you might have interference with lots of other photographers, I can see where you might need the additional channels. For most people this won’t be an issue. Unless you think you need a lot of channels, I think the Phottix units are actually much better than Pocketwizards for OM-D users, and they are 1/3 to 1/2 of the cost — a happy combination. I’m ready for the next meetup.